Bower’s creativity and talent have won him induction into Frets Magazine’s First Gallery of the Greats after five years of winning the stringed instrument, open category of the magazine’s readers’ poll. This distinction put Bowers along side other luminaries, such as Chet Atkins, David Grisman, Stephan Grappelli, Itzhak Perlman, Tony Rice, Rob Wasserman and Mark O’Connor, recognized for their personal accomplishments. In 1993, Bryan was inducted into the Autoharp Hall of Fame to stand only with Maybelle Carter, Kilby Snow, and Sara Carter. From his rather unglamorous beginning as a street singer, Bryan Bowers has become a major artist on the traditional music circuit. He has redefined the autoharp and is also well known as a singer-songwriter. Bryan has a dynamic outgoing personality and an uncanny ability to enchant a crowd in practically any situation. His towering six foot four inch frame can be wild and zany on stage while playing a song like `Dixie’ and five minutes later he can have the same audience singing `Will The Circle Be Unbroken’ in quiet reverence and delight. For nearly three decades, Bryan Bowers has been to the autoharp what Earl Scruggs was to the five-string banjo. He presents instrumental virtuosity combined with warmth, eloquence, expression and professionalism. The history of the autoharp is traced to the late 19th century. 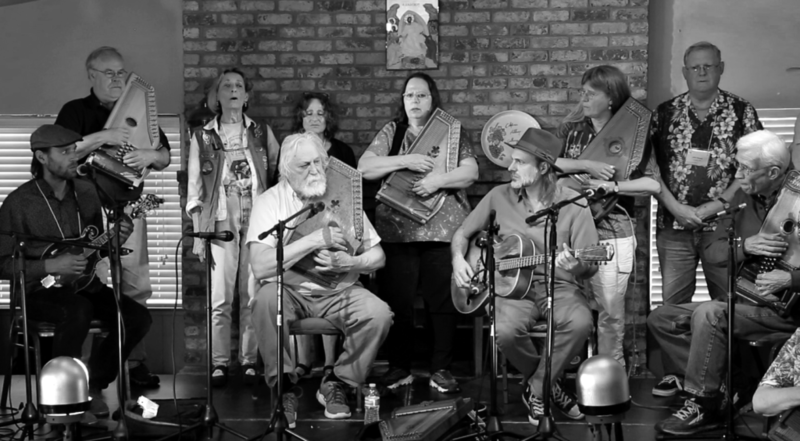 Over the past 130 years, there have been hundreds and thousands of musicians and artists who have strummed, pinched, plucked, and performed songs and tunes on the autoharp. In this time span, there have been just two autoharpists who could be given the title and honor of “grandmaster”, signifying the highest possible achievement in autoharp. Both grandmasters hail from the state of Virginia. The first grandmaster is bestowed upon Kilby Snow, the musical genius who was the first autoharpist to hold the instrument upright and perform distinctive melody notes. The second grandmaster of the autoharp belongs to Bryan Bowers. At the turn of the 20th century, the autoharp was one of the most popular instruments in the United States. It was sold mainly by traveling salesmen and adults used the autoharp for entertainment as a “parlor instrument”. However, keeping an autoharp in tune became a daunting task and most of those autoharps soon found there way under a bed or in a closet. By the 1960s, when Bryan began playing, the autoharp was again considered a “novelty”. Bryan became totally devoted to learning the secrets behind the autoharp. He did this with an tremendous discipline of practicing, sometimes eight hours a day, but usually much more. It was on a beach on the East Coast, during another eight hour practice session, that the magical moment appeared. Bryan had found his style  a version of the “three-fingered roll”, popularized by Earl Scruggs on the banjo. Upon his discovery, Bryan cried and cheered and kept right on playing. As a result of this session, the strings on his autoharp rusted through from the salt air of the ocean! Bryan relocated to Seattle, Washington in 1971 and played for coins as a street singer and in bars for the right to pass the hat. One job Bryan held at this time was delivering mail by car to rural areas outside of Seattle. This job allowed Bryan to continue practicing the autoharp in-between mail deliveries. Bryan met Mike Seeger and together they played music at Bryan’s house. Today, Bryan considers that “jam” was Mike as one of the highlights in his musical career. In 2003, Bryan joined the inaugural California Autoharp Gathering and has been with us ever since. Many professional autoharpists today credit Bryan as being their inspiration. His influence over autoharpists is comparable to the Beatles with rock-n-roll musicians. In addition to his pioneering skills on the autoharp, Bryan has also been recognized with his talents on the mandocello and with storytelling. The California Autoharp Gathering is pleased and proud to host Bryan to our festival once again.